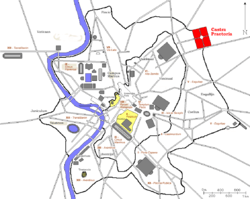 Castra Praetoria were the ancient barracks (castra) of the Praetorian Guard of Imperial Rome. According to the Roman historian Tacitus, the barracks were built in 23 AD by Lucius Aelius Sejanus, the praetorian prefect serving under the emperor Tiberius, in an effort to consolidate the several divisions of the guards. The barracks were erected just outside the city of Rome and surrounded by solid masonry walls, measuring a total of 440 by 380 metres (1,440 ft × 1,250 ft). Three of the four sides of the walls were later incorporated in the Aurelian Walls, and parts of them are clearly visible today. The adjacent city district Castro Pretorio is named after the barracks. The Castra Praetoria was the site of the murder of the Emperor Elagabalus, and his mother Julia Soaemias by the Praetorian Guard in 222 AD. The Castra Praetoria was destroyed by Constantine I, who also disbanded the Praetorian Guard upon his conquest of Italy while Maxentius ruled as the Western Roman Emperor. Their last stand was at the Battle of the Milvian Bridge in 312, and after Constantine's victory he officially disbanded the Praetorian guard, sending them out to different corners of the empire.